The original song was written by Terry Gilkyson and was first featured in the animated 1967 Disney film The Jungle Book. Do you like this new take on the song? The Jungle Book – Show respect to the elephants! King Louis is a damn giant orangutan! Did he get the same DNA injection as those monkeys from Planet of the Apes? This clip of The Jungle Book almost made me cry, lol! Actress Lupita Nyong is lending her voice to Raksha, Mowgli’s wolf mother. She’s perfect for the role! In theaters: April 15, 2016. Baloo doesn’t hibernate but he does nap, a lot actually, and he enjoys honey of course! I guess he’s related to Winnie the Pooh. – and Idris Elba as Shere Khan. The film will open in theaters on April 15th 2016. Anyway, am impatient to see the whole thing! This Superbowl TV spot of The Jungle Book was cut for a maximum impact: awesome! The film is set to open in theaters on April 15, 2016. 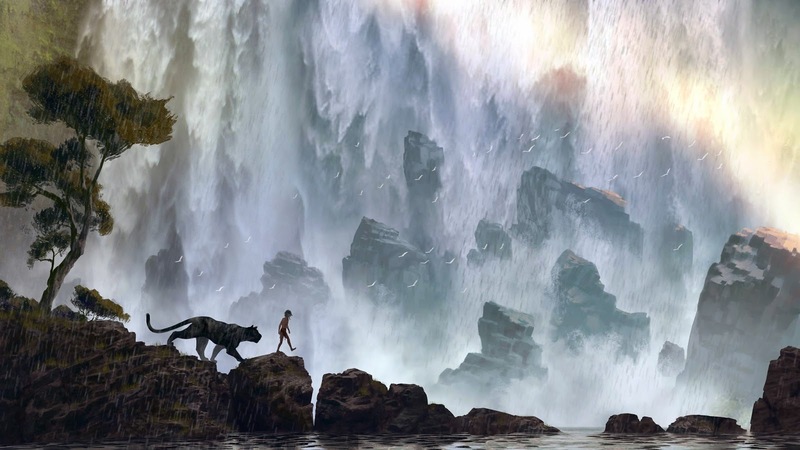 This motion poster of The Jungle Book is barely animated but it’s remarkably exciting! Did you spot the wolves who raised Mowgli in the background? In theaters on April 15, 2016. The fat the orangutan in the middle is King Louie (voiced by Christopher Walken) and the boa constrictor hanging on the tree is Kaa the boa constrictor (voiced b Scarlett Johansson). Damn this trailer of The Jungle Book is really impressive! Jon Favreau and his team really brought the story of Mowgli to life! And the CG effects are awesome! That’s Mowgly (Neel Sethi) and Raksha (Lupita Nyong’o), the wolf who takes and raises in the human boy. The release date of The Jungle Book is set to April 15, 2016. Stars from The Jungle Book appeared at the D23 Expo 2015 during the Walt Disney Studios presentation. The release date of The Jungle Book is set to October 9, 2015.